Ant-Man and the Wasp brings humor and levity back to the Marvel Cinematic Universe. It's loaded with incredible action scenes, really amping up the visual effects from the first film. The plot isn't nearly as clever as the original. One character in particular is the definition of filler, but I did find myself laughing a lot more than expected. 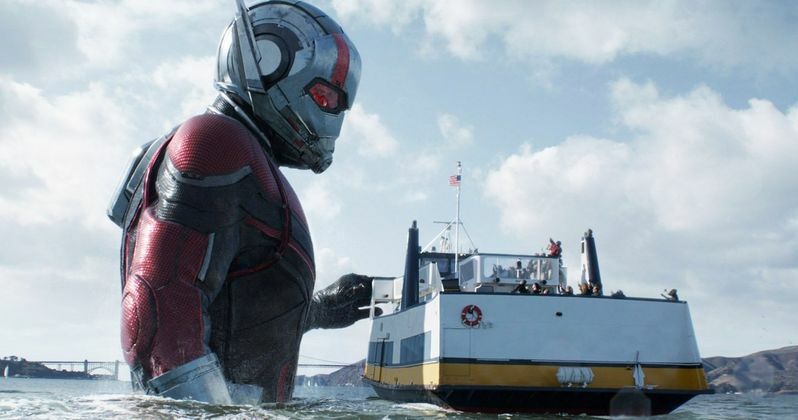 Ant-Man and the Wasp is a breath of fresh air from the staggering bleakness of Infinity War. It does address the events of that film; dropping a major clue to the direction of the next MCU chapter. We pick up two years later in San Francisco. Scott Lang (Paul Rudd) is under house arrest. He struck a deal with the government after intervening on Captain America's behalf during Civil War. Lang has reconnected with his daughter and launched a security business with his old cellmate, the goofy Luis (Michael Pena). A bizarre occurrence brings back Hank Pym (Michael Douglas) and Hope van Dyne (Evangeline Lilly) into his life. They've been on the run since Lang's adventure abroad. Grudges aside, they realize there may be a chance to rescue Janet van Dyne (Michelle Pfeiffer) from the Quantum Realm. The task is daunting enough; made even more complex with the feds, a loquacious gangster, and ghostlike adversary in pursuit. The special effects are the clear standout to this film. The miniaturization and enlarging CGI is freaking spectacular. Ant-Man and the Wasp engage in frenzied battles where they are constantly lurching from big to small and vice versa. Then you have the vehicles, buildings, and army of faithful ants that can literally be carried in a tin. I was also impressed by the aging technology. There are a few scenes that take place when the characters are younger. It's astonishing how realistic it looks. The coolness factor is very high. The effects are used in numerous imaginative ways. They will keep you rapt at attention, especially when the quantum jargon starts to get hazy. Michael Pena steals the show as Luis. I was howling with laughter every time he shows up on screen. The gag is that while Scott Lang is stuck at home, Luis has to step up and be the face of the business. Several of these scenes are hysterical. Director Peyton Reed allows Pena to go overboard with his hijinks. I cannot fathom that all of his quips were scripted. Pena, who has quite a bit of dialogue, elevates the film. While Pena entertains, Walton Goggins comes off as lead weight. He co-stars as Sonny, a technology trafficker who pops up like a prairie dog throughout. The character exists for comic relief and as a generic bad guy. It`s a stale performance that thankfully doesn't detract from the humor. In fact his minions are far more entertaining than him. The plot plays fast and loose with the quantum verbiage. None of it makes that much sense, but you'll be honestly too busy ogling the action to notice. Peyton Reed (Yes Man, Bring It On) has a knack for slick pacing and good ensemble chemistry. Ant-Man and the Wasp flies by at a shade under two hours. From Marvel Studios, Ant-Man and the Wasp is a fun adventure that the entire family can enjoy. It's upbeat, silly at times, a welcome change of tone from the darker themes of the comic genre. There are two post credits scenes. Definitely stick around, they are pivotal to next year's Infinity War conclusion.